Julie Kavanagh, welcome to Romance Lives Forever. 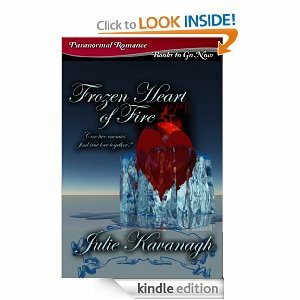 Let's talk about your book, Frozen Heart of Fire. It's Valentine’s Night but Eva, the last of the Ice Witches, isn’t looking for love. 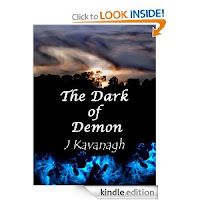 On the trail of a demon, she falls into the clutches of the clan who killed her parents. Joshua Ravenwood believes she is there to assassinate him for the crimes of his people and the presence of the mind-killing pain in his head is surely proof of her intention. Neither of them expected to find passion in the touch of the other but neither can deny the sexual attraction building between them. Will Joshua’s fire burn a pathway to Eva’s cold heart? Can natural enemies become friends and lovers? Eva is an ice witch and demon hunter. She’s 25 years old. Joshua is around 28, heir to the Xandry throne and owns a successful nightclub. Eva looked up, her indignant stare captured by the authority of his beautiful face. Whoever deemed that only women could be called beautiful had never met this man. His looks improved the darker his mood became and she was disturbed at how easily he affected her. The sound of his deep voice sent little shivers travelling along her backbone and his laugh caused ripples of she didn't know what, to twist and mix inside her stomach. “I helped you,” she muttered low, as though she already knew they wouldn’t believe her. She couldn't tell them the truth for she was sure they would declare her a liar and do to her what their clan had done to her elders, and her parents. Did they believe she didn't know? “Yes, you did, and I'm very grateful, but I need more than that.” Joshua leaned in close, his breath warm on the skin of her throat, causing more vibrations to tingle through her body. Was this another spell of his making? I love the freedom it offers. I can become anyone I want to be within my characters. Writing also gives me the opportunity to vent some of my frustrations on my characters especially the nastier ones. When my father died, I used that experience within one of my Demon Witch books. I killed off two very important characters and made my heroine go through the emotions as I did. It was a very cathartic experience. Don’t give up. Never ever give up. I wish I’d been around to offer this advice because for many years I did give up and I regret it deeply but I’m back now writing with passion. I have to write every single day or the voices in my head start to take over. I know it sounds daft but writing helps to dilute the ideas. I don’t always get to choose when I write although late night tends to work better for me. I have a wonderful friend who was having a bad time with her brother and she asked if I could include him in a book. He became a newly made vampire who came to a very sticky end. She loved it! I was asked a few weeks ago by a family member if I used family as characters. Of course, I said no. I have been a Customer Services Advisor, an administrator for a book club. I’ve run my own playgroup, summer playscheme and afterschool club. I spent five years working in a school nursery and three miserable weeks in a hair salon. I would recommend trying the Demon Witch series starring Luca, a half -demon blooded Coven Witch. The books contain romance, passion and danger- not necessarily in that order. I’m totally biased but I love every character in this series – I have fifteen books written with number four about to be epublished. I tend to read just about anything from historical novels to paranormal romances. I’m not very fond of chick lit although I’ve been assured I’m missing out. I love Stephen King and J R Ward. I really wish I’d thought of the Black Dagger Brotherhood. What awesome heroes! I have a few but the most recent was watching my eldest daughter receive her degree from her university. I was the typical mother with tears streaming down my face. She had chosen a difficult path in life it she was determined to get her degree and, although it took longer than we’d all hoped, I was so proud to witness her achieve her dream. Every summer four of us travel around England. We love history and ancient places and there’s so much to see here. The weather isn’t always reliable but we make the most of it. We love to stay in castles and old coaching inns especially if we’re on a ghost hunting trip. I’ve just re-read J R Ward’s Black Dagger Brotherhood series in anticipation of the release of Lover At Last. That’s easy. I was with my husband at my best friend’s house. There was just the four of us, listening to Big Ben chime and watching the fireworks over the Thames on the TV. We always spend New Year’s Eve together, it’s a standing tradition. I like to create. I knit, sew, crochet, embroider and take cool photos. I don’t cook… please don’t ask me to cook – you’ll regret it. Definitely a shade of purple. I'm always ready for another story. When I'm alone, I’m content. You'd never be able to tell, but I talk to dead people. If I had a halo it would be too tight for comfort. If I could be invisible I'd go check out the Queen. I’d love to see how she spends her day. I can never go into small places because I’m claustrophobic. Hi Julie, what an impressive amount of stories you have released. This one looks like another winner for you. Much luck with the sales. Thanks for popping in today, Lorrie!